Preheat oven to 400°. Unfold one pastry sheet. Spread 2 tablespoons mustard to within 1/2 in. of edges. Sprinkle with 1/2 cup cheese; top with half each of the chopped prosciutto and sage. Roll up jelly-roll style. Using a serrated knife, cut roll crosswise into 18 slices. Place cut side down on a greased baking sheet. Repeat with remaining ingredients. Bake until golden brown, 12-15 minutes. Serve warm. Freeze option: Cover and freeze unbaked rolls on a waxed paper-lined baking sheet until firm. Transfer to resealable plastic freezer bags; return to freezer. To use, let rolls stand at room temperature 10 minutes. 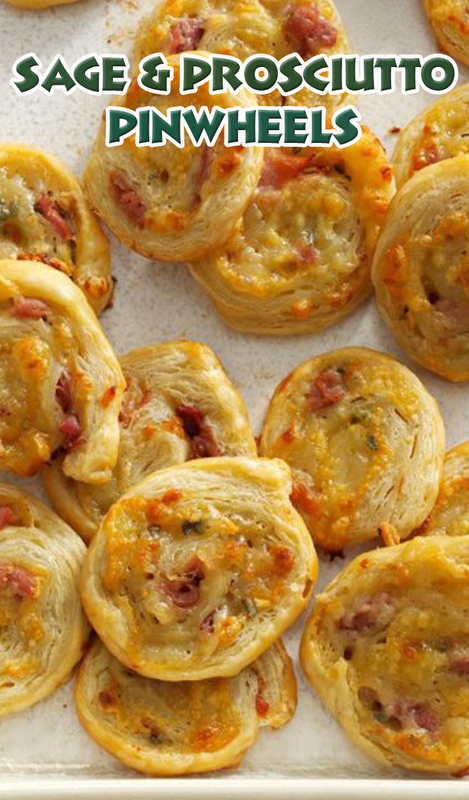 Cut and bake pinwheels as directed, increasing time as necessary.